If you want to know how ethical leaders drive their organizations you may wish to visit the following piece from the Globe and Mail. If you are interested in strategies for ethical influence, you may enjoy this piece from CEO Magazine. There is little use in being ethical if you are unable to influence the thoughts and actions of others. It is one thing to know right from wrong and quite another to act effectively on this knowledge. To put your ethics to work, you have to be able to influence others to do the right thing. Ethics is not a warm, fuzzy feeling that makes you feel good about yourself. It is a commitment to doing your best to make the right thing happen. When you are trying to convince others to follow an ethical path, you cannot use the tools of trickery so often taught in courses on influence. 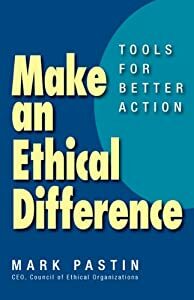 You have to be both effective and ethical in how you get others to agree on an ethical course of action. Here are some powerful tools of ethical influence. Don’t wait for others to show they are committed to doing the right things to make your own commitment clear. One company to which I consult adopted a strict but much ignored policy prohibiting gifts from vendors. One day, the COO of the company received a package from a vendor that contained a gold plaited St. Andrew’s putter built specifically for him. He really wanted to keep it. But he handed it to his administrative assistant with instructions to return the putter to the vendor along with a note about the company’s gift policy. News of his action moved through the company like wildfire, and the gift policy was suddenly real. When you are trying to convince others to act ethically, appeal to their principles before appealing to your own. When you are trying to convince someone to take an ethical course of action, there is a natural tendency on the part of others to see you as trying to force your principles on them. But if you explain why you want to take the course of action in terms of their ethical principles, you start out from a position of respect “I know you believe in giving everyone a fair chance so can we agree …” There is often surprisingly little disagreement at the level of basic ethical principles, so reasoning from the principles of others is often fairly easy. We have looked at several traits of ethical leaders. The final trait has as much to do with what ethical leaders don’t do as much as it relates to what they do. There is a lot excitement in a company when a new opportunity presents itself. Despite this excitement, ethical leaders look at opportunities not only in term of what is gained, but also in terms of the ethical implications of pursuing the opportunity. The CEO of a construction supply company won the right to sell heavy equipment in Mexico. However, he asked his team how they could succeed in Mexico without paying bribes. There was no answer so he passed on the opportunity. The company which seized the opportunity was plagued by corruption charges not only in Mexico but also at home. For ethical CEOS, if you cannot pursue an opportunity ethically, you cannot pursue it at all. We have discussed two traits of ethical leaders – limiting what they say to what they can say truthfully and knowing the stakeholders. In this post, we discuss two more traits of ethical leaders. Surround yourself with truth tellers. Many CEOs express surprise at how little they can directly know about the organizations they lead. All CEOs are dependent on their direct reports and other managers to tell them how things are really going. Ethical CEOs are always looking for direct reports who tell them the truth even when it is very uncomfortable to do so. These CEOs know that they will only be able to learn the truth if they reward managers for candidly delivering bad news. Delivering bad news does not come naturally to highly competitive individuals seeking to advance their careers. It is only by making a conscious effort to reward individuals who deliver bad news that a CEO can gain a realistic idea of what is going on in the organization. No matter how much effort you put into rewarding candor on the part of those who report to you, there is often no substitute for looking at things for yourself. I remember talking to the CEO of a financial services company that had just barely survived a scandal. I suggested that he visit all of the company’s field locations to tell his team what he expected of them and also to listen to how they felt about what had happened. The CEO said, “You means you want me travel around the country and sit on red plastic chairs drinking coffee out of styrofoam cups?” Exactly what I meant. By doing this, he not only put the company back on track, but he also learned how it had gotten on the wrong track. In an earlier post, we noted that ethical leaders often say less but stick to the truth in what they do say. See above for more on that topic. Another trait of ethical leaders is that they know the stakeholders in their business. While almost all CEOs pay lip service to the maxim that shareholder value is paramount, ethical leaders realize that a company is successful only if it gives priority to many stakeholders. Not only does a corporation depend on it employees and customers; it also depends on its suppliers, the media, regulators at multiple levels, environmental critics, the financial community, political allies and many other stakeholders. While some CEOs focus only on shareholder value, ethical leaders try to balance the interests of stakeholders so that they align in support of the corporation. Some call this social responsibility, but it is just common sense to ethical leaders. I think we all know that people look at things differently when it comes to ethics. But did you know that there are distinct ethical types? And do you know your own ethical type? Try the article at http://www.huffingtonpost.com/mark-pastin/whats-your-ethical-type_b_8962356.html to learn more about ethical types.